The essay below found on 123HelpMe.com called The “Doctor Who Saved Boston.” is about Dr. William J. Morgan, the brilliant hand surgeon who helped the Red Sox win the World Series for the first time in 86 years. Morgan performed surgery on Curt Schilling’s severely damaged ankle that allowed him to pitch in game 6 of the ALCS against the Yankees when we were down three games to two. No known medical or surgical options existed to allow Schilling the functionality to pitch. But just as things were looking bleak Dr. Morgan miraculously performed an unprecedented procedure he invented that allowed Schilling to pitch seven innings winning the game 4-2. He created a wall of stitches to hold Schillling’s torn tendon sheath in place before game 6’s win and again before game 2 of the World Series that we also won. And October 27. 2004 is a magical date for red sox fan. Watching it unfold with my wife and daughters and the joy and excitement that followed is a vivid memory for me that I will never forget and it should be noted that without Dr. Morgan that night would never have happened. Without Dr. Morgan the curse would not have been reversed. He is a true Boston hero. But, as with all of us, he is not perfect. In November of 2003 he was arrested for driving under the influence and, as a Massachusetts doctor, he was mandated to Physician Health services (PHS) under a monitoring contract. According to news sources from February of 2010 Dr. Morgan was forced to give up his right to practice medicine in Massachusetts as a result of “unspecified allegations” and reading these reports the assumption that he must have done something very wrong is assumed–a logical and rational conclusion based on how we assume the world works. 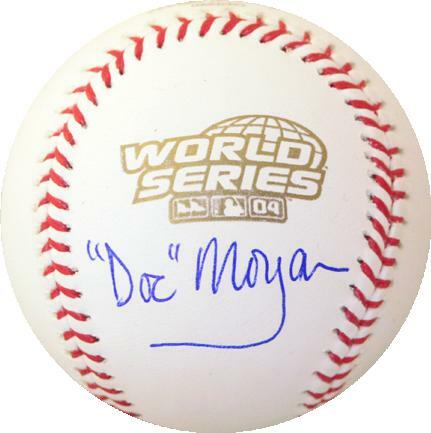 I was reminded of doctor Morgan because today is opening day for the Red Sox. Over the past couple weeks I have been contacted on average four time a day by doctors who are currently suffering under their state physician health programs or by those who wanted to tell me of the circumstances surrounding the suicides of doctors they loved. The stories I have been hearing are heartbreaking and unreal but the patterns are the same. One of the most bothersome facts is that I have yet to hear from anyone who was truly an addict or alcoholic. Like Dr. Morgan, some life event bought them a one-way ticket into a PHP and from that point on their lives and locus of control was placed in the hands of others. Most of the doctors I have spoken to are good and kind doctors who were referred for situational factors and one-offs–mistakes or circumstances that were transient. Many were given positive tests using the non-FDA approved laboratory developed tests (LDTs) and pulled out of practice resulting in suicide. The “unspecified allegation” leading to Dr. Morgans 2010 loss of license was that he had a positive Phosphatidyl-ethanol (Peth) test ordered by Dr. Luis Sanchez and reported as positive by USDTL. And as seen here, these two cannot be trusted. Intentional fraud perpetrated in this manner requires zero tolerance. It also brings into question the validity of all testing done by PHS and performed by USDTL. 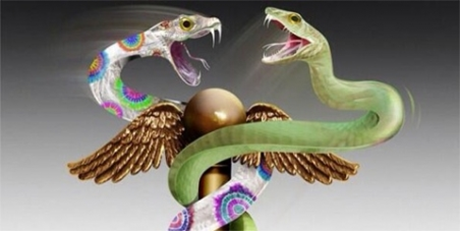 It is extremely concerning that criminal acts done under color of law is not being addressed by the state medical society and the Department of Health (DPH). None of these apply here. I happen to know that the positive test given to Dr. Morgan was not the result of anything he did. Sanchez and Jones claim professionalism and high ethical standards but the undeniable evidence shows they are unethical individuals engaging in criminal acts. These need to be exposed and those involved need to be held accountable. Schadenfreude is a word taken from German and literally means “harm-joy.” Along with psychopathy and narcissism. schadenfreude seems to be a common characteristic of those involved in PHPs. Deriving pleasure in the misfortunes of others and particularly if that person is someone who represents what they could never be. I understand they took particular pleasure in bringing down Dr. Morgan and he deserves to be restored to his status as a true Boston hero. The city of Boston and Red Sox fans everywhere have the responsibility to make sure they be charged criminally by law enforcement. We owe it to Dr. Morgan and any others who have been victimized by the Massachusetts PHP. 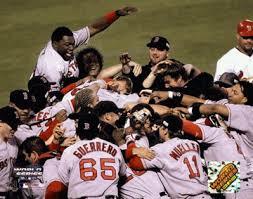 Whether it is David Ortiz’s walk off performances against the Angels and Yankees, Manny Ramirez’s tape measure home runs, or Derek Lowe winning the clinching games of all three playoff series, Red Sox nation will not soon forget the memories that the “bunch of idiots,” as centerfielder Johnny Damon dubbed this year’s Sox club,provided them, nor will they forget the Sox all out assault on baseball and Boston sports history. But of all the images the fans retain, of all the feelings they experienced, of all the heroes Sox nation put on an altar and worshipped – the most memorable has to be Curt Schilling pitching three games on an inured ankle, blood from broken sutures seeping through his sock and a look of obvious discomfort on his face, winning two, and capturing the heart’s of every member of Red Sox nation. But to understand the elation of the Nation and the reason that it has turned Curt Schilling into a God in the church that Cy Young, Ted Williams, and Carl Yaztremski built, we have to take a step back and remember the predicament that the Red Sox were in just over two months ago. It was October 12, and the Yankees had beaten the Red Sox in Game one of the ALCS. It was only one game, but that familiar feeling was back. That familiar feeling that Red sox fans have of doom and gloom lingering just over the horizon returned. Curt Schilling, the hired gun, the man who Sox management had brought in to beat the Yankees in just this situation, had not only lost the game, but looked utterly ineffective in doing so, allowing six runs in just three innings of work and the media was reporting that Schilling may not pitch again. On June 10, reports came out on ESPN and in the Boston papers that Schilling had a minor injury to his ankle but that he would pitch through it and make his start that night and would not have to go on the disabled list.What came out later on in the papers was that Schilling had made the majority of his starts in the 2004 season only after undergoing shots of marcaine, which sportsinjuries.com describes as a long lasting local anesthesia that is used for pain management and works by blocking nerve sensations.The attitude that the Red Sox seemed to take toward Schilling’s injury was no harm, no foul, and after June little was heard about Schilling’s ankle, that is until October 5.October 5 was the beginning, and almost the end, of the Red Sox 2004 playoff run. It was a glorious, and infamous, day in Red Sox history. Curt Schilling pitched 6 and 2/3 strong innings at Anaheim, allowing just two runs and scattering nine hits as the Red Sox cruised to a 9-3 victory. But late in the sixth inning, Schilling pulled up lame after fielding a slow roller down the first base line and throwing the ball over first baseman Kevin Millar’s head. He was favoring that same right ankle that had been hurting him all year. Back to October 12, and the feelings of anxiety that every Sox fan from Maine to Rhode Island no doubt had in the pit of their stomachs. Questions were swirling around Boston. Just how serious was Schillings injury? Could he pitch again? Would he pitch again? Is there a God? Jamie Musler, an assistant clinical specialist at Northeastern, put the injury into perspective. Musler said that Schilling tore the tissue that covers his peroneal tendon, which sits in a small groove in the fibula and is partly responsible for moving and planting the foot. Musler said that this type of injury is caused by a traumatic event to the foot or ankle, like a significant ankle sprain, and when Schilling was moving his foot, the tendon was slipping out and causing an uncomfortable, but not necessarily painful, snapping sensation because the tendon was snapping across the fibula. This, Musler said, would directly affect foot mechanics and cause a huge problem in Schilling’s delivery. And it would present a huge road block in Boston’s attempt to win a World Series title. Schilling meant more to the 2004 Red Sox club than any other player. He was the tone setter and the ace, and without him the Sox would have no chance against the hated Yankees. After Pedro, things got even bleaker, with inconsistent and fragile Derek Lowe, aging and unpredictable knuckleballer Tim Wakefield, and young, playoff inexperienced Bronson Arroyo filling out the rotation. These four hurlers are serviceable and talented major league pitchers, but they were not the automatic win that Schilling had proved himself to be in postseason’s past, especially in 2001, when he garnered co-MVP honors after defeating the Yankees in the World Series. So in comes the man from behind the scenes. The man who would help the Red Sox end 86 years of playoff futility, Red Sox team doctor Bill Morgan, who talked about the injury and treatment in “Faith Rewarded,” the DVD that the New England Sports Network (NESN) recently released. “It was a very unique situation. Either we did this or (Schilling) didn’t pitch,” Morgan said. “And he was determined that he was going to pitch, no matter what it took.” But what could Morgan do? What followed was possibly the most publicized treatment of a sports injury in history. One could not turn on a New England news program or open up a New England paper without the top story being about Curt Schilling’s right ankle. First, according to boston.com, the Red Sox front office brought in Dr. George H. Theodore, chief of foot and ankle service at Massachusetts General Hospital, to help Dr. Morgan try to create a brace to immobilize Schilling’s ankle while he pitched. The idea was that by eliminating movement of the ankle he would eliminate movement of the tendon and eliminate the sensation. But the problem, Schilling insisted, was that the sensation was altering his delivery, and that became apparent after his struggles in Game one of the ALCS. File that idea in the circular cabinet. Next on the block, according to boston.com, was pair of customized cleats. Morgan had Reebok play around with different styles of cleats, from high tops to low tops, raised bottoms to lowered bottoms, in an attempt to find Schilling a comfortable medium. No dice. Schilling still could not get comfortable. According to the Massachusetts Medical Board’s website, Dr. William Morgan is an orthopedic surgeon who specializes in hand surgery. He has his own private practice in Brighton, but his primary work setting is in hospitals. Morgan works out of several area hospitals and rehabilitation centers, including St. Elizabeth’s Medical Center of Boston and New England Baptist Hospital, New England Rehabilitation Services of Central Massachusetts, Worcester Medical Center, and University of Massachusetts Memorial Medical Center. Morgan also works out of the Massachusetts Hospital School. Morgan got his degree from the Texas Medical College and Hospital in Galveston, Texas. He received post graduate training at the University of Massachusetts Medical Center. He continued his post grad training in hand and upper extremity surgery at the Roosevelt Hospital in New York, Brigham and Women’s Hospital, New England Baptist Hospital, and the Kantonspittal in Basle, Switzerland. Morgan performed successful wrist surgery on one former Boston Red Sox superstar shortstop Nomar Garciaparra, allowing him to come back from what could have been a career altering injury as the All Star he was before he was injured. The point is that Morgan is not some shaky med student on his first hospital residency. He has been around the block a few times and he knows his orthopedic surgery. Morgan, it would seem, did just that, and came up with a new treatment, which he based off of the usual treatment for Schilling’s injury. Musler said that the usual treatment for the injury is to go in and deepen the groove that the peroneal tendon sits in. Musler showed me a video of the procedure in which surgeons cut away the tissue surrounding the tendon and the tendon sheath and then used a surgical drill and chisel to physically deepen the groove in the fibula that the tendon sits in. The surgeons then sutured the sheath back in place and closed the opening. But Morgan and the Sox didn’t have that much time. They had four days. They went in, did the procedure, gave Schilling another marcaine shot, and, as they say, the rest is history. Schilling came back and won game six against the Yankees. After the game, Morgan took out the sutures, Musler said, to avoid infection. Morgan did the procedure again before Game two of the World Series, and Schilling would later say that had the series gone past four games he and Morgan had decided not to do the procedure again and that Schilling would shut it down for the rest of the series. This time, Schilling was pitching on what is the biggest stage in sports, the World Series, against the best hitting team in baseball, the St. Louis Cardinals, whose line up featured Albert Pujols, the best young hitter in baseball and an MVP candidate, Scott Rolen, the RBI leader in the NL during the regular season, hard hitting and speedy shortstop Edgar Renteria, and two probable Hall of Famers in outfielders Larry Walker and Jim Edmonds. Schilling was dominant. He made the heralded and hyped Cardinal offense look like a team of Little Leaguers as he pitched six strong innings allowing no earned runs and only four hits. The rest, as they say, is history. The Sox would go on to sweep the Cardinals in four games, ending their 86 year dry spell of World Series titles and sending New England into a euphoria that it has still not recovered from. But one has to wonder if there will be any lingering effects from the injury. Will Schilling be alright to pitch next year as the Sox try to repeat as champs? Mary J. Hickey, an Assistant Clinical Specialist in the Northeastern department of Physical therapy, thinks so. “Curt made an informed choice about his ankle. I don’t think there will be any long lasting damage,” Hickey said. But Schilling is not out of the woods yet. Hickey said that Schilling faces at least four to six weeks in a cast, during which he will be seen often by Morgan and the Red Sox medical staff, and Musler said that Schilling faces five to six months of rehab to get back his range of motion, endurance, strength, and sports’ skill. Musler said that this could risk further injury if Schilling is not properly prepared for next season and presses when he is not ready. Regardless of rehab and healing time, Curt Schilling and Red Sox fans are on cloud nine. The Red Sox are World Series champions for the first time in 86 years, and Sox fans have a new hero and new memories. The memory of Curt Schilling, of him pitching hurt, grimacing in the dugout, bloody sock and all, will remain with everyone who saw it, even Yankees fans, forever. Schilling billed himself as the hired gun, a man who said in an interview with the Boston Herald before the ALCS that “he was not sure of any scenario more enjoyable than making 55,000 people from New York shut up.” But in the end he was so much more than just a hired gun, he was a hero in real red socks. And he made more than 55,000 people from Boston stand up and applaud as he became the newest Red Sox player to be canonized in the church of Red Sox nation, alongside Yaz, the Kid, Pudge and Cy. 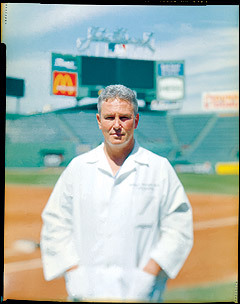 And not to be forgotten is the man behind the scenes, the quiet and unassuming surgeon who made it all possible, Dr. William Morgan, whose name will be forever linked to Curt Schilling, the Red Sox and the 2004 World Series. He may not have thrown a pitch or swung a bat, but William Morgan saved the 2004 Boston Red Sox from being another team that just missed. And he saved Red Sox fans from finally having to utter those awful words – “wait ‘til next year.” But because of Bill Morgan and the entire Red Sox medical staff, next year is this year.